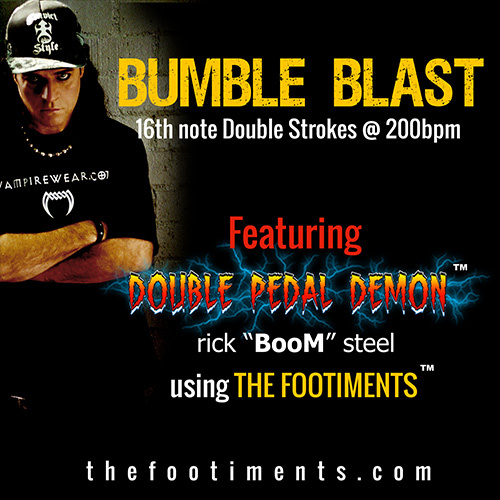 At his YouTube page (www.youtube.com/thefootiments), BooM says,”…Doubles, Flams, Ruffs, and Paradiddles: NOT just for the hands!” With Bumble Blast, he exemplifies how you can use the materials from his book. “Some Classical Music-when played as Metal-is heavy”, says BooM. “When performing ‘Flight of the Bumble Bee’, many orchestras invite a guest soloist to show off their chops. So, I used crunchy guitar, heavy bass, keyboard, and cranked the tempo to 200 beats per minute”. But, after some great advice from the late Ron Spagnardi, BooM decided to begin writing his book, “The Footiments” (www.thefootiments.com). He explains, “I was my ‘own’ student. I wrote the book so I could achieve the 200 Club!” For those in the know, his Double Pedal Double Strokes are played ‘heel-toe’. BooM remembers the first time he used this technique with a band. “After Gregg Bissonette (David Lee Roth, Joe Satriani) recorded the drum tracks for the band “Bleed”, he wasn’t available for the live shows”. Vocalist Robin McAuley (MSG,Survivor) and Bjorn Englen (Quiet Riot,Yngwie Malmsteen), after watching BooM play, offered him the gig. “I remember putting in some 16th and 32nd note double strokes”, says BooM. When recording the last ‘Thirty Round Clip’ CD (www.thirtyroundclip.com), he applied Double Pedal 16th note triplets to the song, “god Media”. “At first, our producer Darian Rundall (Pennywise, Suicidal Tendencies) was a skeptic. He didn’t think I could dig out the triplets at 150 b.p.m.’s”. Using the Double Stroke Footiment, BooM was successful….producer happy.